To improve emergency response to snake bites and address concerns on anti-venin administration, IRRI hosted the Snake Bite Medical Management Training of the IRRI-UPLB Management Committee at the Harrar Hall Seminar Room on 20 June 2012. Thirty-five participants attended the training event, most of them doctors and nurses from private and public hospitals and municipal health units of Los Baños and Bay, Laguna, and IRRI Clinic and SSS-Emergency Services staff. Topics discussed included key characteristics of snakes, antivenin production, and snake bite first aid and medical management, including anti-venin administration. Resource persons were Leticia Afuang (faculty, Animal Biology Division, UPLB), Fedelino Malbas, Jr. (head, Veterinary Research Department, Research Institute for Tropical Medicine or RITM), and Manolito Chua, MD (medical specialist, Medical Department, RITM). 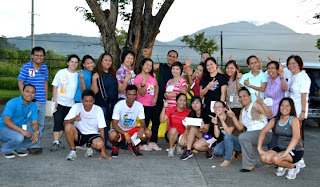 SINoP successfully sponsored a Fun Run last Friday, 22 June 2012. This is another fund-raising activity of the organization to provide umbrellas/raincoats for the school children of Pinagpala Orphanage House and Bagong Silang Elementary School, a SINoP-adopted school, in Los Baños. Fun Run winners were Gilbert Pablo (SSS) and Roland Dizon (CESD) for the men's division, and Leiss Jansenne Gelera (CPS) and Lea de los Reyes (LDS) for the women's. SINoP would like to thank all the participants, members, and friends for their support. Compared to previous versions, which were made by two small cottage industry-type workshops in Los Baños, Philippines, the new unit is equipped with improved electronics and manufactured using state-of-the-art processes by Nanodevice Technologies, Inc., an electronics manufacturer in Manila. Manufacture quality is therefore greatly improved. The company also applies quality control procedures and provides a warranty, which was not the case with the older units. By pooling resources from the IRRI Postharvest Project (funded by the Asian Development Bank), Irrigated Rice Research Consortium's Postproduction Workgroup (funded by the Swiss Agency for Development and Cooperation), and other sources, IRRI was able to place an initial order of 350 units. This enticed Nanodevice to do the adaptive R&D to replace expensive circuits imported from developed countries by cheaper components from China and redesign the electronics for a more automated production. Thirteen participants are attending the latest batch of the Research Data Management (RDM) 101 training course, which runs for 3 half-days on 26-28 June 2012 at the I.T. Learning Center in IRRI. 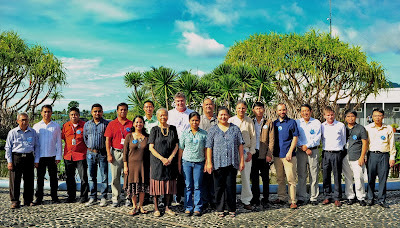 The course aims to train IRRI research staff on good practices for gathering and managing research data. Topics include organizing raw data in spreadsheets and databases; and data manipulation, checking, and validation. File management tools are also introduced and demonstrations conducted. The participants are composed of data encoders, researchers, and M.S./Ph.D. scholars from IRRI. Research data management is an important area of responsible conduct of research. Research data should be managed, shared, and preserved properly; management of it ought to be planned well right from the start of any project. The resource person for the course is Marco van den Berg. 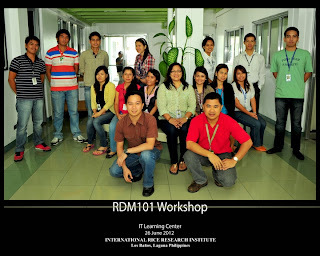 The RMQA-RDM 101 training team is composed of Menchu Bernardo, Icoy Mercado, and Dec Arreza. by USAID Administrator Rajiv Shah on 8 June 2012. Gary Jahn, former IRRI entomologist and crop protection specialist based in Cambodia, IRRI headquarters, and Laos over the years (1995-2008), recently joined USAID in Washington D.C. as an agriculture development officer. Gary will be working with Rob Bertram and Saharah Moon Chapotin in the Food Security Bureau. Bas Bouman, new director of GRiSP. 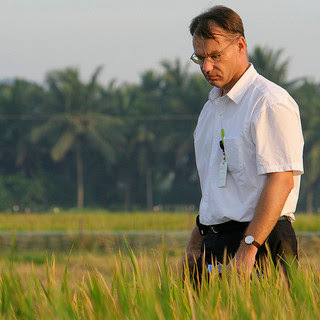 Bas Bouman, currently head of IRRI’s Crop and Environmental Sciences Division, has been named director of the Global Rice Science Partnership (GRiSP)—the CGIAR research program for rice—effective 1 September 2012. GRiSP aligns the rice research activities of IRRI, AfricaRice, and CIAT, as well as the French international research institutes IRD and CIRAD and the Japan International Research Center for Agricultural Sciences (JIRCAS), and brings together more than 900 other international and national research and development partners to focus on innovative integrated solutions to improve rice-based production systems and their value chains. In his new role, Bas will provide strategic guidance, develop effective implementation mechanisms, and build outstanding teams to implement the GRiSP strategy and work plan. He will be based in Los Baños. Bas was selected through an open, competitive recruitment process that included an extensive global search over many months. To his new role, Bas will bring a strong background in agricultural research for development, a proven record of strategic thinking and research leadership, and demonstrated experience in managing interdisciplinary teams and large research programs. Achim Dobermann had led the development of GRiSP and has held the challenging role of GRiSP director, in addition to being IRRI's deputy director general for research, since GRiSP was launched in November 2010. 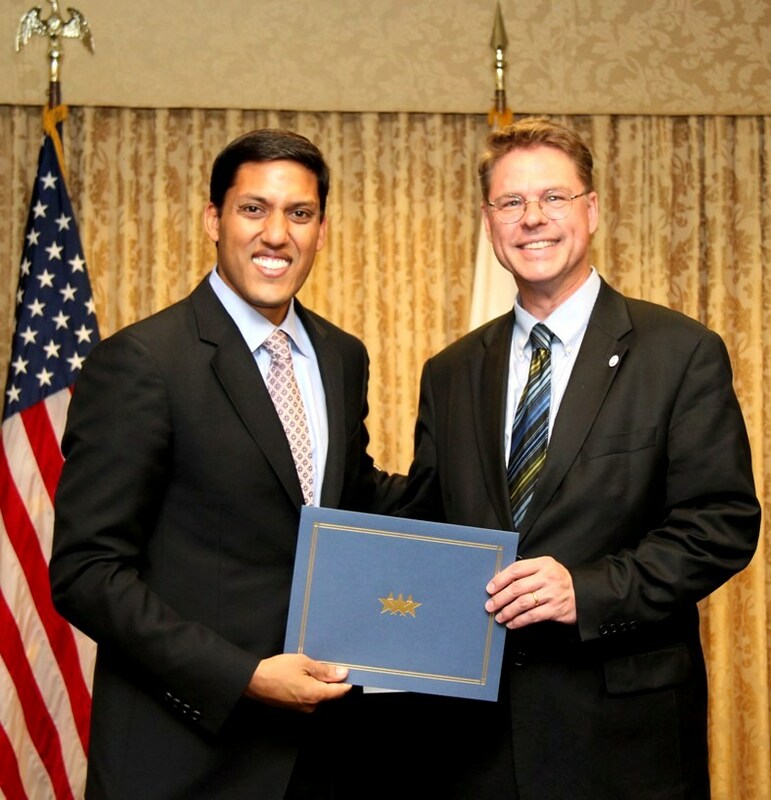 Achim will support Bas in the transition to his new role. a smartphone app developed by Filipino students. A mobile phone application that allows a user to check rice crop quality through a smartphone image has won the 2012 SWEEP Innovation and Excellence Awards, hosted by Smart Communications, Inc., in the Philippines. 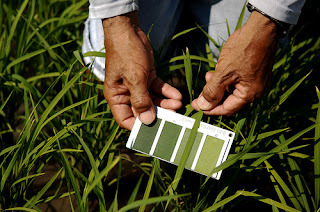 The innovation is based on the leaf color chart (LCC) developed by IRRI in partnership with the Philippine Rice Research Institute (PhilRice) in 2004. The LCC features 4 colored panels, ranging from dark to light green, that extension officers or farmers can use as an index to measure the nutrient status and quality of rice leaves. In essence, it helps users determine the amount of nitrogen needed by a crop for maximum yield. The LCC-based mobile application, which won the grand prize of Php 100,000 (about USD 2,400) in this year's SMART SWEEP awards, was developed by students from the Bataan Peninsula State University. The mobile phone application uses both the features of a smartphone and internet connectivity. It consists of a program that detects and analyzes the color of rice leaves using input from a smartphone camera. Upon assessment of the image, the application will display a report of any significant deficiencies and provide suggestions to improve the quality of the rice crop. "It's very refreshing and inspiring to see innovations like these, and I'm glad that younger Filipinos today find themselves looking for solutions that could help address problems, or simply jumpstart progress, in our agricultural sector," says Bruce Tolentino, deputy director general for communications and partnerships at IRRI. Dr. Tolentino congratulated the team that developed the LCC-based application, composed of Maria Crizele de Jesus, Alejandro Garcia, Jr., Jun Alvin Galang, Jairus Fernando, and McJefren Quiñones. To reduce the incidence of common medical problems in IRRI's host communities of Los Baños and Bay, IRRI, through its Host Country and Community Relations Office, conducted another community health education and medical mission for the lakeside barangay of Bayog, Los Baños, on 1 June 2012. 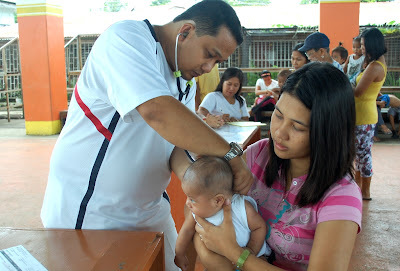 More than 500 residents, mostly unemployed or of low income, were given free medical check-ups and hygiene, health, and wellness counseling by medical practitioners from the Philippine Army, headed by Mary Agnes Motril, M.D. United Laboratories (Unilab) and the Hasik Bagong Buhay Christian Ministry donated medicine and vitamins that were given away for free. IRRI's Epidemiology and Crop Health Group held the Review workshop and training on statistical analysis of crop health data in the Philippines for 36 participants from IRRI, the Philippine Rice Research Institute (PhilRice), the Department of Agriculture, and state universities. The workshop, organized in collaboration with PhilRice, was held on 29 May-1 June 2012 at Taal Vista Hotel in Tagaytay City, Philippines. The workshop was conducted under the Food Staple Self-Sufficiency Roadmap of the Philippines (FSSSP, formerly the Rice Self-Sufficiency Plan of the Philippines) and is part of activities on characterization of crop health and production situations in the Philippines. PhilRice research staff presented and discussed data collected from surveys of farmers’ fields and RICE-PRE experiments conducted in various PhilRice stations. 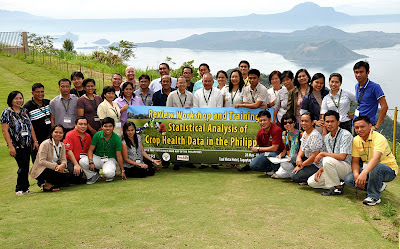 The rest of the sessions were spent on lectures, discussions, exercises, and demonstrations on the synthesis of crop health data, R, basic concepts of statistical analyses, and statistical analyses using R.
The workshop is the fourth of a series on crop health in the Philippines. The first workshop was held on 4-7 August 2009 in PhilRice, Nueva Ecija and the second on 5-7 April 2011 in Iloilo City, and the third on 6-8 December 2011 in Butuan City, Agusan del Norte. Twenty participants from different organizations gathered at IRRI headquarters on June 4-7, 2012 for a workshop on the new project called Remote sensing-based information and insurance for crops in emerging economies, also known as RIICE. 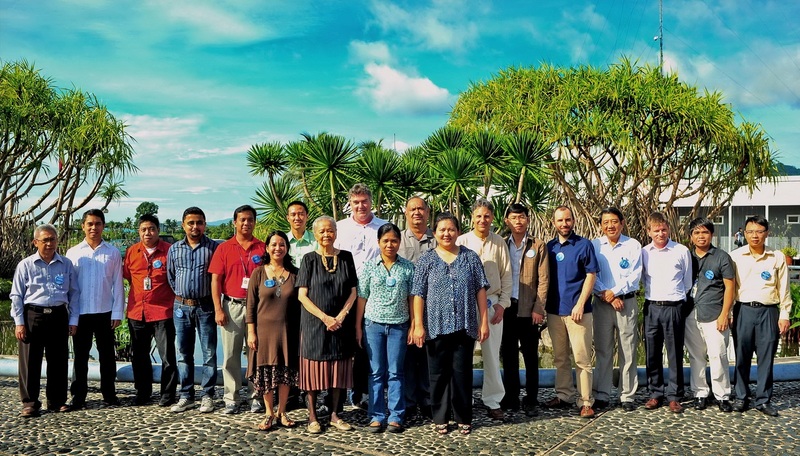 The workshop presents the first opportunity for national partners to meet with the RIICE project coordinators, to share information on the rice-growing environments and challenges in each country and to develop workplans for the coming cropping seasons. In achieving those two goals, the partners of RIICE will use remote sensing technology, based predominantly on high-resolution synthetic aperture radar (SAR) satellite data. This data differs from optical satellite data in that it is radar-based and, hence, available regardless of weather conditions and light source (radar can “view through the clouds” and operates day and night). RIICE expects to have the following impact: that rice production will increase in the long run due to farmers getting better access to information about the actual growth status of observed rice crops and forecasted yield, damage, and crop loss. Crop insurance is often an indispensable condition in obtaining an agricultural loan by a rural bank. Agricultural credit in turn, will spur investment into higher yielding crop sorts. 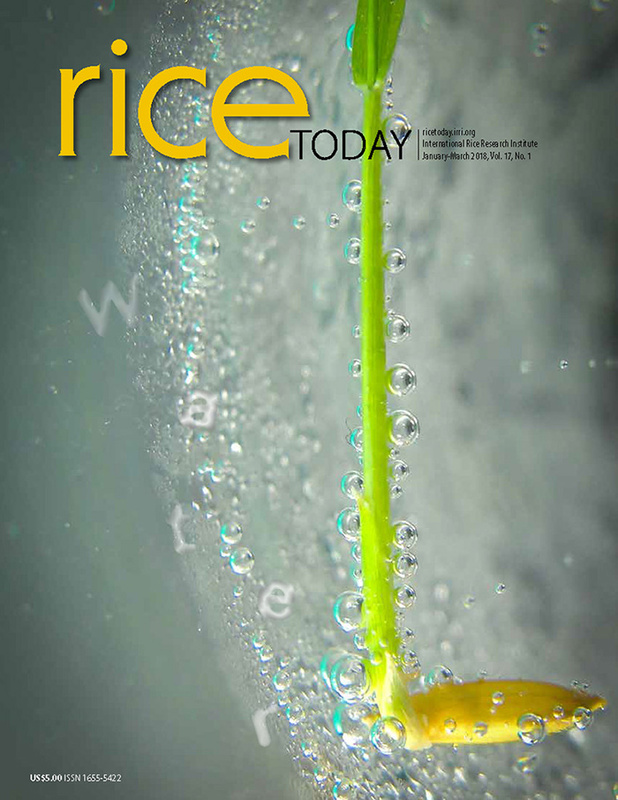 The RIICE project focuses on rice-growing areas in seven Asian target countries; Bangladesh, Cambodia, India, Indonesia, the Philippines, Thailand, and Vietnam in the first 3 years. A public-private development partnership is implementing the project. The partners are Sarmap SA, a Swiss-based technology company supplying the necessary remote sensing technology; IRRI, which coordinates national partners, collects field data, and estimates rice yield; Allianz Re, providing insurance services to small-holder farmers as beneficiaries; and the German Agency for International Cooperation (GIZ), providing capacity building to local aggregators. The Swiss Agency for Development and Cooperation (SDC) is the main source of funding of the project. RIICE is expected to improve existing agricultural insurance solutions and help to establish new ones that are more transparent and sustainable given the use of remote sensing technology. At the same time, RIICE is geared to provide more precise and timely information to governmental institutions, allowing them to make better decisions to enhance food security in the target countries.